One of the more fascinating aspects of the Second World War was the use of propaganda on home front society. In Propaganda, Edward Barnays notes the limited use of the practice prior to the First World War. By the time hostilities erupted in 1914, however, governments around the world used propaganda and the politics of persuasion to mobilize and persuade its citizens and military. Propaganda was a burgeoning business, and business was booming. Many propaganda advertisements once again targeted the home front during World War II. Home front Propaganda existed to “sell you” something, both tangible and figurative. During the war, the concepts “sold” to the public could be a variety of things: war bonds, scrap drives, victory gardens, ride-shares, or secrecy. They even sold the American public on grapefruit juice. The Florida Citrus Commission began advertising the state’s orange, grapefruit, and tangerine crops in the years before World War II. Many growers and cooperatives came about in the 1930s, such as Florida’s Natural Growers (Now called Florida’s Natural). The Commission set up to promote the two main citrus crops, oranges and grapefruits, due to the competition from California. Their base of operations moved to Lake Wales, Florida, outside of Orlando. During the war, Florida’s Natural Growers produced concentrated orange juice for the military. Because of the increased demand, most of the crop produced went to the government for distribution. Millions of cans were sent to both theaters of operation. 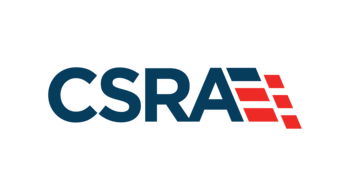 The Florida Citrus Commission did their fair share of lobbying, both for their product and for the War Production Board (WPB) that supervised governmental production. Both were successful. By 1944, shipments were made regularly from Florida, surpassing their California competitor as the top dog of Vitamin C.
Florida citrus became big business during the war, paving the way for a blossoming $100 million industry. The crop was also the subject of many famous propaganda posters. The demand left the popular product vacant on store shelves around the country. 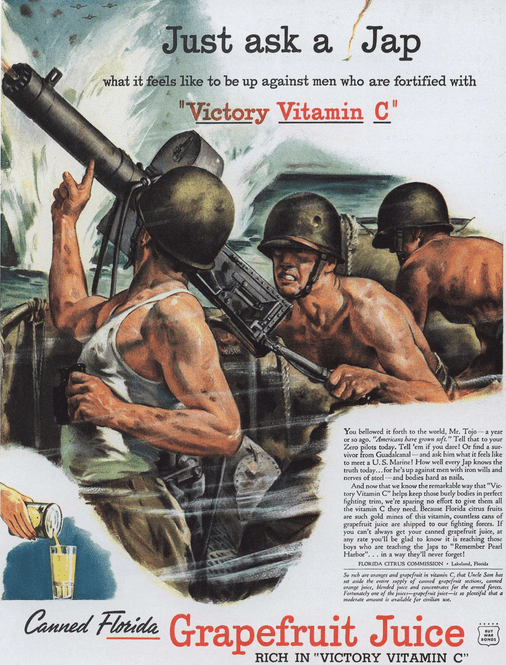 The Commission produced these propaganda posters shown below as a way to inform the general public WHY their grapefruit and orange juice was gone, and how it was helping win the war. According to The Ads that Won the War, the Commission produced advertisements that were both “typical and classic” of the era. Like other propaganda focused on the military, the Commission made sure they all had their fighting boys in the midst of action or combat.” You this clearly with the anti-aircraft advertisement above. The commission paid to advertise in major magazines like LIFE. 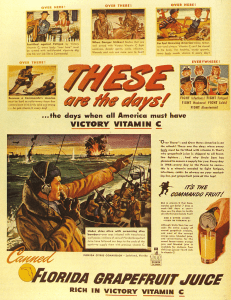 The most important and central theme in all of the advertisements was that, despite its shortage, the delicious orange and grapefruit concoctions would come back. 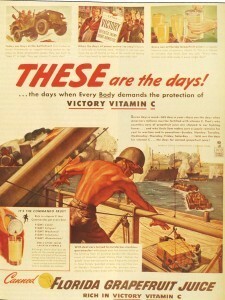 In the meantime, the civilian sacrifice meant that countless sailors, airmen, soldiers, and Marines would get their needed Vitamin C.
Several Florida Citrus Commission advertisements featured the United States Navy. 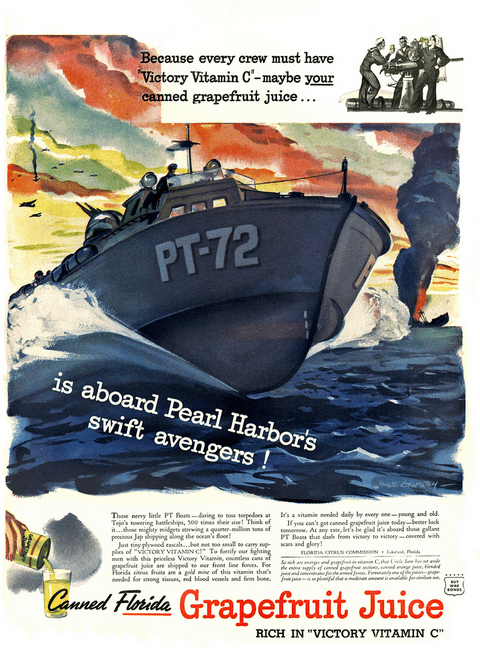 The May 1944 example shown below is full of illustrations, themes, and logos. The Florida Citrus Commission was quite clever with their slogans. Many advertisements would posit that canned grapefruit juice was the “Commando Fruit.” Others proclaim their fighting boys were filled with cans of “victory” Vitamin C.
You can also see it is part of the “Food fights for Freedom” home front campaign, which featured other popular commercial characters like the Campbell Soup Kid. 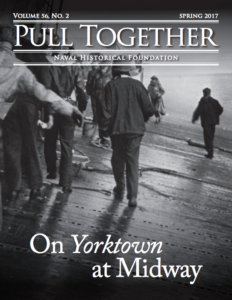 The Ads That Won the War and others will be available at this week’s NHF Book Sale inside the U.S. Navy Museum from Tuesday to Friday (9am to 3pm) of this week. Stop by and get some great deals on some books! Interested in ww2 my dad was on the bunker hill when it was hit by kamikazes. Very interesting post! As the owner of a Florida based citrus gift fruit company and lover of all things citrus in general, I can’t imagine seeing empty shelves in the citrus section of the grocery store. Though there was good reason for the absence and it looks like the Commission went out of their way to let everyone know why those shelves were empty.